Here at Damon Orthodontics, Dr. Derek R. Damon and our dental team know the importance of having a healthy smile that lasts a lifetime! With two orthodontic practices conveniently located in Bellingham and Anacortes, WA, Damon Orthodontics is proud to offer world-class orthodontic treatments to successfully straighten your teeth, including offering Invisalign for both teens and adults! As Invisalign clear braces are quickly becoming a more popular and effective alternative to traditional metal braces, it’s crucial for all of our patients to fully understand the ins and outs of the revolutionary Invisalign system, thus ensuring a mouth full of healthy teeth during your Invisalign treatment period. While wearing traditional metal braces is still the most common way to straighten teeth, they tend to be clunky, uncomfortable, and sometimes painful to wear! As many older teens and adults need braces to correct their smile, wearing highly-noticeable metal braces is not always the most fun option. Traditional braces use metal brackets and wires that are bonded to the teeth with dental cement, making it easier for food and bacteria to get stuck in the mouth, and more difficult to properly clean your teeth. Invisalign relies on a series of clear, removable plastic trays (aligners) to straighten teeth. These aligners are virtually invisible when worn, and can be easily popped in and out for short periods of time to eat, drink, brush, and floss. This means that almost no one will know you are straightening your teeth! Due to the versatility of Invisalign, it’s much easier to adjust to life with your new aligners versus getting used to the semi-permanence of traditional metal braces. Getting metal braces can sometimes be a trial and error process with no immediately discernible date of when they can be removed. With Invisalign, that’s a thing of the past! Beginning with a smile scan, Invisalign patients know exactly what to expect from the moment the scan is complete. 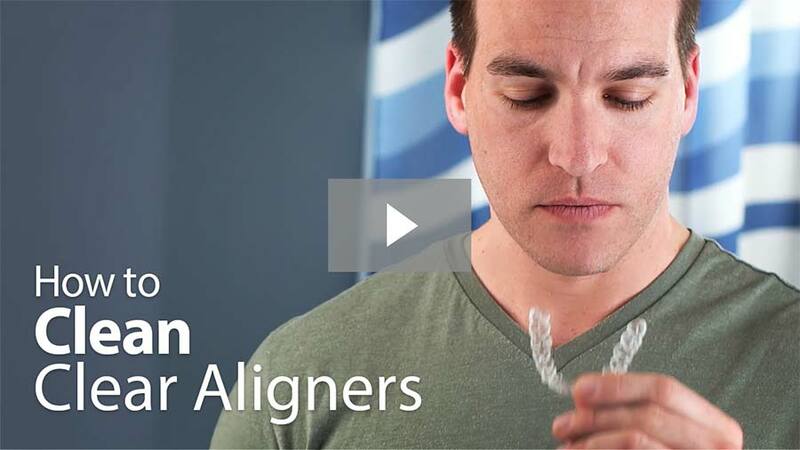 Invisalign’s iTeroElement® Scanner provides immediate, comprehensive knowledge on the condition of their mouth, and how long the treatment plan will take to straighten their teeth. For each stage of treatment, Invisalign will manufacture two plastic mouth “trays” or “aligners,” one to fit over your top teeth and one for the bottom. You will wear this first set of trays for two weeks, for a minimum of 22 hours per day. You will then move on to the next set of aligners in your series to accomplish the next stage of gradual movement. You will continue this process, as indicated by your Bellingham family orthodontist, until your teeth have reached their ideal positions! Traditional metal braces cause the cosmetic appearance of the mouth to look noticeably abnormal. As the unsightly chunks of metal take up the entire mouth and cover your teeth, they allow food particles to get stuck in between the braces and the teeth, sometimes without even noticing. With Invisalign clear braces, those problems are non-existent. Choosing Invisalign lets the wearer feel more confident in their braces, as they oftentimes aren’t noticeable at all. Made with 3D printed thermoplastic material, Invisalign braces are virtually invisible. Once traditional metal braces are put into place, they cannot be removed until the recommended duration of time has been completed. Also, it takes a separate appointment and a professional dentist to remove the glued-in metal braces from the teeth and mouth. Invisalign braces are meant to be worn 22 hours each day, but are completely removable by the wearer, making it easier to eat or drink without them for short periods of time. Metal braces contain wire and protruding bits of metal that can puncture or scratch the insides of the mouth. Using a great deal of force to straighten the teeth, metal braces can easily cause bacteria build-up that leads to demineralization and cavities. On the contrary, Invisalign braces are soft and smooth trays made of 3D printed thermoplastics. With the ability to remove them at any time, an Invisalign wearer can ensure that their teeth are kept healthy and clean every step of the way. As a whole, Invisalign clear braces are less impactful on the mouth and teeth. No glue, no metal, no mess. Some wearers of traditional metal braces have to keep them glued in for nearly five years for proper straightening to occur. Invisalign treatments can hit their targeted straightening goal in as little as one year! Everytime you remove your Invisalign trays, it’s crucial to clean them properly! Dry saliva and plaque create a perfect breeding ground for foul smelling bacteria. Soaking your aligners in denture cleaner, Retainer Brite, or the official Invisalign cleaning crystals are all excellent options for keeping your trays clear and sanitized. You can also clean your aligners with a clear, antibacterial soap. Clear, antibacterial soap is an excellent and inexpensive way to keep your aligners clear, fresh, and free from harmful bacteria. As a side note, it’s not advised to use toothpaste to clean your trays, as this will scratch the plastic and create places for bacteria to live inside your aligners. With the convenient ability to remove your Invisalign aligners at any time, it’s integral to keep your teeth adequately brushed and flossed daily. While your aligners are pressed tightly against your teeth, your saliva will not be able to naturally wash away any of the gunk left behind, causing unwanted bacteria build-up directly on the enamel of your teeth. Thoroughly brushing and flossing your teeth after every meal will help maintain great oral hygiene during your Invisalign treatment process, preventing plaque, tartar, and cavities. What’s The Difference Between Invisalign And Invisalign Teen? Eruption Tabs: Eruption tabs hold space open for teeth that haven't finished erupting yet. Blue Dot Wear Indicators: Emblazoned on every aligner, these tell doctors, parents, and teens themselves if the aligners are being worn long enough. 6 Extra Sets Of Aligners: Every treatment course comes with 6 free replacement aligners, so there's no need to worry about losing aligners. Call Damon Orthodontics In Bellingham Or Anacortes, WA Today For Invisalign! As a whole, Invisalign and Invisalign Teen offer a plethora of advantages over traditional metal braces. With removable trays, no sharp or protruding edges, and a shortened treatment time, Invisalign and Invisalign Teen are great alternatives to traditional metal braces. To find out if you or your teenager are candidates for Invisalign, don’t hesitate to contact Damon Orthodontics in Bellingham or Anacortes, WA today to schedule a consultation! You can also request an appointment with our easy-to-use online form. On behalf of our entire staff at Damon Orthodontics, we can’t wait to help you achieve a smile you’re proud to show off!